Tanacetum parthenium, known as feverfew or bachelor's buttons, is a flowering plant in the daisy family Asteraceae. It is a traditional medicinal herb which is commonly used to prevent migraine headaches, and is also occasionally grown for ornament. It is also commonly seen in the literature by its synonyms, Chrysanthemum parthenium and Pyrethrum parthenium. The plant is a herbaceous perennial that grows into a small bush up to 70 cm (28 in) high with pungently-scented leaves. The leaves are light yellowish green, variously pinnatifid. The conspicuous daisy-like flowers are up to 20 mm across, borne in lax corymbs. The outer, ray florets have white ligules and the inner, disc florets are yellow and tubular. It spreads rapidly by seed, and will cover a wide area after a few years. Feverfew is native to Eurasia, specifically the Balkan Peninsula, Anatolia and the Caucasus, but cultivation has spread it around the world and it is now also found in the rest of Europe, North America and Chile. A perennial herb, it should be planted in full sun, 38 to 46 cm (15–18 in) apart and cut back to the ground in the autumn. It grows up to 70 cm (28 in) tall. It is hardy to USDA zone 5 (−30 °C (−22 °F)). Outside of its native range it can become an invasive weed. In traditional herbal medicine, feverfew has been used for fever, headaches, arthritis, and digestive problems. The active ingredients in feverfew include parthenolide. There has been some scientific interest in parthenolide, which has been shown to induce apoptosis in some cancer cell lines in vitro and potentially to target cancer stem cells. There are no published in vivo studies of parthenolide or feverfew for humans with cancer. The parthenolide content of commercially available feverfew supplements varies substantially, by over 40-fold, despite labeling claims of "standardization". A study found that the actual parthenolide content of these supplements bore little resemblance to the content claimed on the product label. Long-term use of feverfew followed by abrupt discontinuation may induce a withdrawal syndrome featuring rebound headaches and muscle and joint pains. 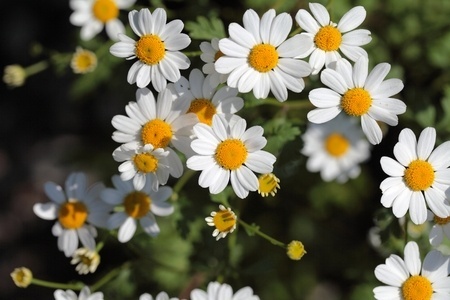 Feverfew can cause allergic reactions, including contact dermatitis. Other side effects have included gastrointestinal upset such as nausea, vomiting, abdominal pain, diarrhea, and flatulence. When the herb is chewed or taken orally it can cause mouth ulcers and swelling and numbness of the mouth. Feverfew should not be taken by pregnant women. It may interact with blood thinners and increase the risk of bleeding, and may also interact with a variety of medications metabolized by the liver. The word "feverfew" derives from the Latin word febrifugia, meaning "fever reducer", although it is no longer considered useful for that purpose. Though its earliest medicinal use is unknown, it was documented in the first century (AD) as an anti-inflammatory by the Greek herbalist physician Dioscorides. Johnson, E. S.; Kadam, N. P.; Hylands, D. M. (August 31, 1985). "Efficacy Of Feverfew As Prophylactic Treatment Of Migraine". British Medical Journal (Clinical Research Edition). 291: 569–573. JSTOR 29520398.